B2B sellers like you are under pressure to deliver personalised, relevant information to buyers – faster than ever – in this rapidly evolving digital landscape. Focus on getting customer insights from data instead of getting bogged down by repetitive administrative tasks. Help you compare your sales technology stack to your peers. Provide a better understanding of the needs of digitally empowered B2B customers. 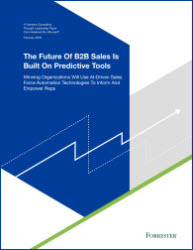 Give you insights from research experts on AI-driven predictive sales tools.